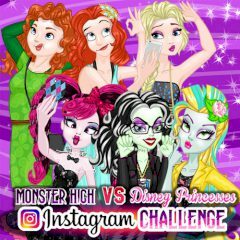 Two groups of girls will compete with each other in the Instagram Challenge. Change faces and haircuts for both princesses and the monsters. Who do you think will win the challenge? Many girls follow each other via Instagram, but some of them build groups like Monsters and Disney princesses. They know about the existence of each other, but both groups think they are better. Well, it's time to figure this out thought a challenge. Take two photos and dress up the girls!